Any increase in VAT will severely affect restaurants located in rural regions, along with businesses in border counties. 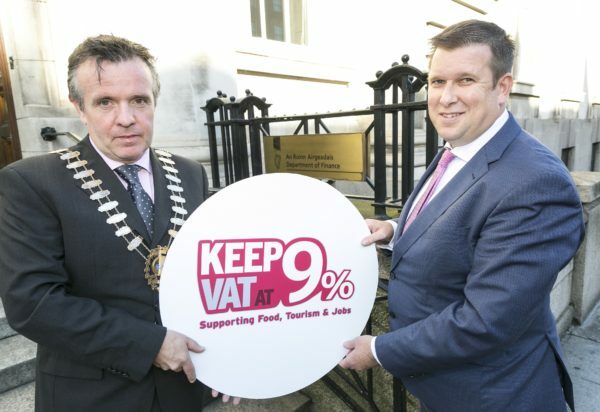 Restaurants Association of Ireland (RAI), CEO, Adrian Cummins has today expressed deep concern about any increase to the 9% VAT rate for tourism-related goods and services. In accordance with a recent Jim Power economic report released by the RAI, Mr Cummins has stated that the rumoured increase to 11% VAT would risk 12,000 jobs in the face of a potential hard Brexit. A comparative of Q2 2011 and Q1 2018 demonstrates the advantages of the reduced VAT rate to the sector, as well as to overall employment within Ireland. Between Q2 2011 and Q1 2018, the number of people working in the accommodation and food services sector nationally increased increased by 54,400, taking total employment from 117,300 to 171,700 on a seasonally adjusted basis. The sector also accounted for 7.7% of total employment in the economy in the first quarter of 2018. Restaurants in general will suffer if visitor numbers from the UK decline due to sterling weakness or Brexit. Restaurants in the border counties are particularly vulnerable to sterling weakness as this occurrence results in less people travelling across the border from Northern Ireland. Customers from the South will also have a financial incentive to travel North of the border for better value-for-money. Should the VAT increase, restaurants in rural regions have further been identified as a key vulnerable zone. These businesses, which span the country, will suffer if indigenous exporters, which are very important contributors to rural economic activity, come under pressure due to these factors. Sterling weakness and its consequences will remain a serious threat if a ‘Hard Brexit’ transpires, indigenous Irish exporters will come under significant pressure. Farming and agri-food businesses are likely to be particularly vulnerable. If rural businesses suffer, the restaurant sector in rural areas will be particularly vulnerable. The Dublin market will be less vulnerable, due to its capital city status. If the Common Travel Area is not preserved, the outlook for the UK tourism market will become very pressurised. If the UK leaves the EU’s Open Skies arrangement, air travel between Ireland and the UK could be adversely affected, with negative consequences for tourism and by implication, every aspect of the hospitality or tourism sector. Wage pressures are building in the economy due to a combination of minimum wage increases and market pressures of the labour market. Given the labour intensive nature of accommodation and food services, this sector is particularly vulnerable to wage pressures. In recent years, Ireland’s hospitality industry has been experience severe staff shortages. Earlier this year, the RAI released the results of a benchmark survey conducted by BDO, which examined the current outlook of licensed restaurants in the industry. Of those surveyed, 82% of respondents indicated that they were finding it difficult to attract and recruit staff to their business.While this challenge was apparent in all areas of the industry, there was a noticeable prevalence of this issue in the area of chef staffing as 84% of respondents reported that chef positions are proving the most difficult position to fill. An increase in VAT will only further add to these staffing issues as employers will find it difficult to hire additional staff during peak times, while offering competitive salaries to current staff members. Where there is any possibility of an 11% VAT rate being introduced in Budget 2019, the impact on the overall competitiveness of the tourism sector must to be the key consideration. For many operators, (particularly outside of Dublin) absorbing an increase of this magnitude could be the difference between success or failure. If the increase in VAT were to be passed on to the consumer, it would seriously damage the competitiveness of a sector that is already coming under significant pressure from currency movements, Brexit, staff shortages, rising insurance costs and other financial pressures. “I am appealing to the Government to think twice before increasing the VAT rate to 11%. 9% VAT is what is appropriate for our industry, but it has proven itself as a success for Irish tourism. In the face of the high possibility of a hard Brexit, this increase will cause enormous damage to the economy of border counties and rural Ireland, should it go through,” says Cummins. Maintain 9% VAT for the hospitality sector into Budget 2019.